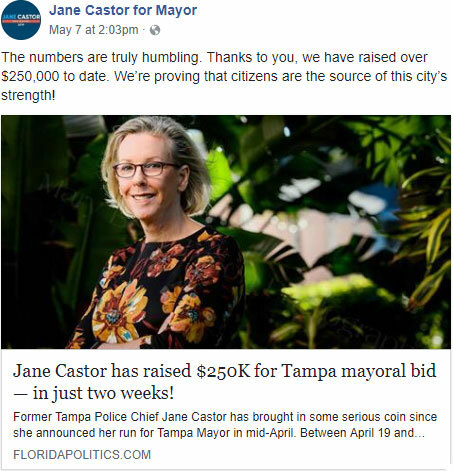 Campaign finance reports for the month of April show former Tampa police chief Jane Castor raised $33,540 in April from 89 donors. A political action committee called “Tampa Strong,” which is likely to support the same issues Castor does, raised $15,250 in April, with $10,000 of that from four corporations writing checks for $2,500 each. The FloridaPolitics.Com article stated that the funds were raised from “more than 300 donors” and the feat had been accomplished “since she announced her run for Tampa Mayor in mid-April.” Therefore, additional funds in excess of $216,460 must have been raised during the first six and a half days in May for her “over $250,000” claim to be true. That scenario is so unlikely that it can be safely dismissed. 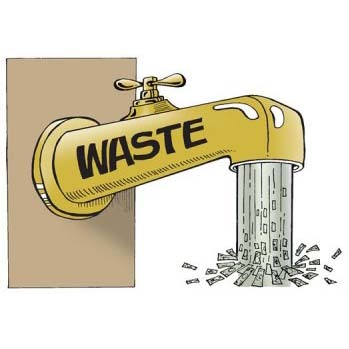 The Tampa Bay Times reported that “Castor’s campaign said it and an associated committee have raised about $250,000 so far.” Given that a total of $224,962 had been raised through the end of April and the campaign’s claim of “over $250,000” on May 7th, it can be deduced that approximately $30,000 was raised in the first week of May. The month of April also saw Castor tell a Tampa Bay Times’ columnist that her police department’s 2015 highly criticized “biking while black” citations “were a mistake.” Castor’s change in position came one week before announcing her run for mayor. In 2015, Castor defended the citations while refusing interview requests from the Times about the matter. Castor’s designated campaign staff also didn’t respond to our April 26th request for an interview or answer questions about her May 3rd fundraiser at the private Tampa Yacht & Country Club. That event was not announced on her campaign Facebook or Twitter pages, while events in fundraising events in Seminole Heights and at Ulele Restaurant were announced through those channels. The host committee for the yacht club fundraiser invitation listed 16 people, of which four are lobbyists. The Seminole Heights event listed a different group of people, and a “suggested contribution” of $250, compared to $500 at the yacht club event. The presence of lobbyist Patrick Baskette on Castor’s host committee may signal that Castor is willing to spend public funds on a new Rays stadium in Ybor City. Baskette and Ron Christaldi are both lobbyists at Shumaker, Loop and Kendrick, and Christaldi has taken a leading role in trying to bring baseball to Ybor. Castor’s campaign appears to be trying to soften her previous “tough cop with arms crossed” image in favor of bright colors and approachability. Former St. Pete mayor Rick Baker’s makeover last year didn’t bring him victory in that city’s mayoral race, and even earned him some ridicule. How Castor’s policy and appearance makeovers will be received by Tampa voters remains to be seen. Her opponents view Castor as current mayor Bob Buckhorn’s proxy and she will certainly get his endorsement in due course. Some fear that Castor will only serve four years and then step aside in order for Buckhorn to return as mayor. That prospect is either appealing or unappealing, depending largely on how satisfied a person is with how the City of Tampa has been run under Buckhorn. Castor’s opponent Ed Turanchik raised $22,145 in April from 85 donors and leads overall fundraising with $102,100 raised for his campaign. Castor is averaging $376 per donor and Turanchik $361. There are seven announced candidates, with Turanchik and Castor viewed by many as the candidates with the best chance of winning. However, unforced errors like this week’s misleading claims about its own fundraising could create headwinds for the Castor campaign even before hurricane season begins June 1st. As always….the Guardian reports and our readers decide. Like our Facebook page to find out when we publish new stories.